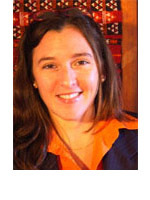 Ana Fostel is an associate professor with tenure at George Washington University. She earned a PhD in Economics from Yale University in 2005 under the direction of John Geanakoplos, Herb Scarf and Andres Velasco. Her research efforts concentrate on the intersection of Finance, International Finance and Economic Theory. Within these areas, her work has focused on several topics such as theories of leverage; securitization and asset pricing; sovereign debt and default; financial globalization, liquidity under-supply; and revealed preference theory. She teaches undergraduate and graduate courses in Finance and International Economics.